ISAF denied that its troops had any part in destroying a Quran and would deplore such an action. Kabul, Afghanistan (CNN) -- The Afghan government is blaming Pakistani intelligence agents and al Qaeda for burned Qurans found in Helmand Province last week, a spokesman for the provincial government said. A sack of burned Qurans was discovered by troops with the NATO-led International Security Assistance Force (ISAF) and Afghan forces, said Daoud Ahmadi, the Helmand government spokesman, on Wednesday. The Quran is the holy book of Islam. They were found in a home in the district of Garmsir on Friday along with some ammunition, Ahmadi said. The owner of the home said the Qurans' burning was caused by an airstrike, but there was no other damage from an airstrike in the area, he added. The owner of the home -- whose son is a member of the Taliban -- has been arrested in connection with the discovery, Ahmadi said. Two others have also been arrested, he said, for allegedly distributing pages of the burned Quran to area villagers. The Afghan government has concluded that the Qurans are part of a plot by the enemies of the country to stir up the populace, Ahmadi said. He said it shows that ISI -- or Pakistani intelligence agents -- smugglers and al Qaeda are using such tactics to plot against foreign forces and have local residents turn against them. Earlier this month, a violent protest broke out in the Garmsir district after rumors circulated that ISAF soldiers desecrated a Quran during an operation against the Taliban. During the January 12 protest, an insurgent sniper shot an Afghan official, an ISAF statement said, and ISAF service members then shot and killed the sniper. ISAF denied that its troops had any part in destroying a Quran. "While denying these allegations, we take them very seriously and support a combined investigation with local Afghan authorities," said Maj. Gen. Michael Regner, deputy chief of staff for operations for ISAF Joint Command. 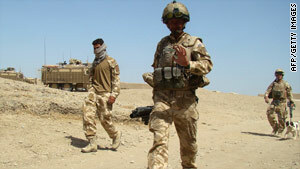 "ISAF is an international force that includes Muslim soldiers, and we deplore such an action under any circumstances." A fatwa, or religious legal ruling, has been issued by a group of religious scholars against whoever was involved in burning the Qurans found last week. The scholars were consulted by the local government in Lashkar Gah.